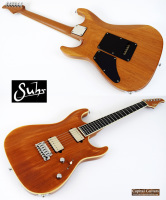 Check out this very cool, one-off Suhr Standard Carve Top built in 2013. It's model name notwithstanding, there is nothing "standard" about this custom guitar. This beautiful solid body arch top electric has a one piece Mahogany body with comfort contours and a two piece Mahogany top with ivoroid binding. 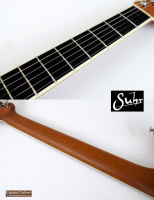 The bound neck is also made of Mahogany and has an Even C Medium neck shape (.840" - .920") but it feels chunkier than it's dimensions would suggest. It has a Black Ebony fretboard with 10"-14" compound radius, a 1.687" Tusq nut, medium Stainless Steel frets and side dots, but no fretboard inlays. 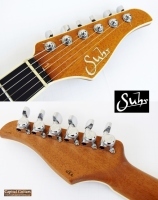 The headstock is also bound and has a MOP Suhr logo inlay. 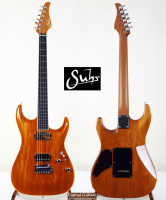 The tuners are Suhr locking units and the bridge is a Gotoh 510 trem with steel block. 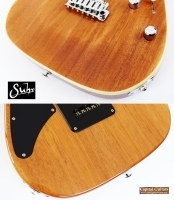 The electronics include two SSV humbuckers with volume, tone and a five-way blade switch. The five way switch gives you: 1) neck humbucker full; 2) neck split; 3) bridge & neck outer coils; 4) bridge & neck inner coils; 5) bridge humbucker full. The guitar's total weight is 7.8 pounds. With it's arched top and Mahogany construction, playing this instrument makes me think of a Strat-shaped Les Paul style guitar. The neck is relatively wide and feels great. 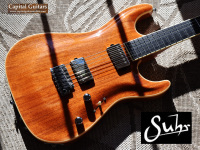 Being a custom Suhr guitar, the playability is fabulous and the setup superb. The tones in switch positions 1 and 5 are warm and fat, while positions 2 through 4 have a Strat-like quality, making this an extremely versatile guitar. Please check out the short sound sample provided. This fabulous instrument is in near mint condition with virtually no significant flaws and the Stainless Steel frets are flawless as well. It comes in it's similarly mint G&G case with the trem arm, tools, fretboard protector and paperwork. Because this guitar has no Rosewood content, it can be exported to outside the US without a CITES certificate. 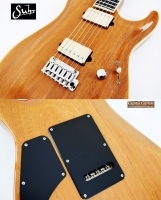 Get yourself something extremely special with this Suhr Standard Carve Top. Very nice indeed!